But what does it mean for the next five years of European policy? 1. Tusk will push Europe toward sharper confrontation with Russia. As the first Polish Council president, Eastern and central Europe will have a louder voice than ever in the ongoing discussion over the appropriate European response to Russia. Though he might not be as strident as Polish foreign minister Radek Sikorski (a one-time candidate for the high representative job), Tusk has taken a hard line against Russian aggression in Ukraine in the past five months since Russian troops effectively annexed Crimea. Caught between imperial German and Russian aggression since the 17th century, and most recently trapped behind the Soviet Union’s Iron Curtain during the Cold War, Poland is particularly sensitive to Russia’s designs on eastern Europe. 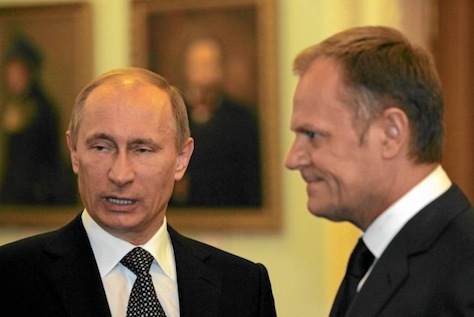 Though national European leaders will continue to drive foreign policy with more consequential effect than EU institutions, Tusk’s ability to influence the debate could push Europe ever so slightly towards a harder line against Russian president Vladimir Putin (pictured above with Tusk) in terms of both rhetoric and economic and political sanctions. 2. Juncker and Tusk will wage an institutional fight over EU power. The Lisbon Treaty never quite established bright lines between the Council presidency’s powers and the Commission’s powers. Both are, in essence, executive bodies within the European Union, with the Commission fulfilling a greater administrative and regulatory role and proposing legislation to the European parliament, while the Council sets policy at a more strategic level. But personal dynamics matter, as former Commission president Jacques Delors showed when he forcefully propelled economic and monetary union to the forefront of the European agenda, culminating with the 1992 Treaty of Maastricht that established the eurozone. 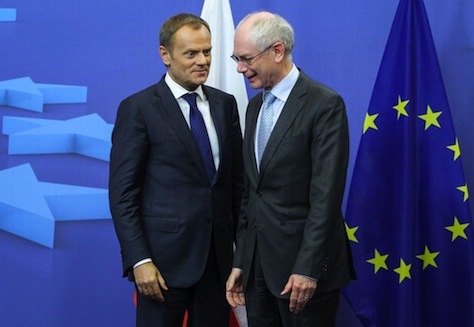 Van Rompuy has taken a somewhat subdued approach to the Council presidency, but Tusk may be ambitious to grab more power for the position — possibly at Juncker’s expense. 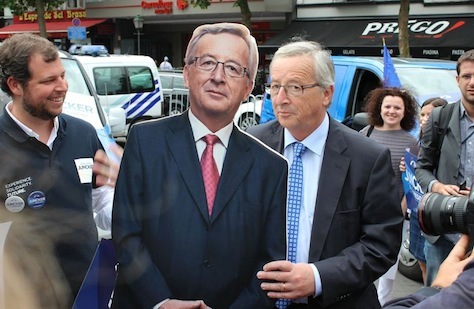 It won’t necessarily be an open war, but Tusk and Juncker (pictured above) are now subtle rivals as much as allies. 3.The rising German-Polish axis may be becoming more important than the fading Franco-German axis. Tusk, a longstanding figure in European politics, has a strong working relationship with Merkel — if he didn’t, he probably wouldn’t have become Council president. But more fundamentally, his rise to the Council presidency showcases the growing importance of the German-Polish axis. Though Germany is clearly at the heart of European policymaking, especially with regard to fiscal policy, for much of the history of the European Union and its predecessor, the European Economic Community, policy was more often established through back-channel consensus in Paris and Berlin. That’s changing for a lot of reasons. France, with its own economic and social problems, has fallen behind Germany economically over the past five years, and it’s struggling to find economic growth in a competitive, global marketplace while maintaining its commitments to social welfare. 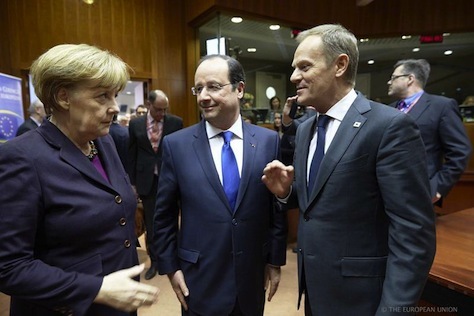 Moreover, Merkel and the incredibly unpopular French president François Hollande (pictured above with Merkel, left, and Tusk, right) lack the friendly relationship that Merkel and Hollande’s center-right predecessor, Nicolas Sarkozy, enjoyed. That’s left France and Germany on opposite sides of the European debate over austerity and the aggressiveness of monetary policy. Meanwhile, the 2004 and subsequent EU expansions brought 13 new member-states to the European Union, all of them to the east of France, shifting the EU’s center of gravity. Though France still has a $2.7 trillion economy, the EU’s second-largest, Poland’s $520 billion economy is growing faster. It’s already the EU’s eight-largest economy and, by far, the largest of the new central and eastern European states. France is still, after Germany, the second-most populous EU country with 66.6 million people, but Poland, with 38.5 million, is the sixth-most populous. Tusk’s elevation reflects that Poland, as a link between Germany and the rest of eastern and central Europe — ‘new Europe’ — can only grow stronger. 4. Poland will get a new prime minister in the next three months. Though Tusk’s government has reaped the benefits of Polish nationalism in the face of a more assertive Russian foreign policy, he always faced an uphill flight to win reelection to a third term in elections to be held before October 2015, especially after the revelation of embarrassing taped telephone conversations involving Sikorski, central bank president Marek Belka and other top figures. Obviously, Tusk won’t be leading Civic Platform into those new elections from Brussels, so his party will have to choose a new leader, which will give Tusk’s successor a running start at winning a third term. If elections were held today, Law and Justice would win a narrow victory under the leadership of former prime minister Jarosław Kaczyński, the twin brother of the late former president Lech Kaczyński, who died tragically in a 2010 airplane crash. So who will replace Tusk? He won’t be leaving for Brussels until December, so he’ll have some time to prepare his government and influence the choice of his successor. Though Sikorski is, by far, the most well-known member of his government abroad, he’s unlikely to take the top spot. 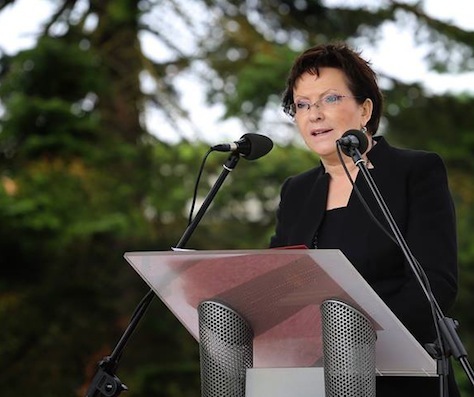 Ewa Kopacz (pictured above), age 57, who served as minister of health in Tusk’s first government and who currently serves as the marshal of the Sejm, the lower house of the Polish parliament, essentially its speaker, is probably the early favorite to succeed Tusk, and she would be Poland’s second* female prime minister. A steady pair of hands, untainted by scandal and a Tusk loyalist, she might stand the best chance of leading Tusk’s party to a decent result — or even victory — next year. Other contenders include national defence minister Tomasz Siemoniak, age 47, deputy prime minister Janusz Piechociński, age 54, and Jacek Rostowski, age 63, until November 2013 finance minister of Poland and one-time heir apparent to Tusk. 5. Italy is back at the heart of Europe. Italy currently holds the rotating six-month presidency of the European Council, and it’s fitting that it comes at a time when Italy is once again firmly at the heart of the European Union, following a period when its debt crisis and the increasingly embarrassing antics of former center-right prime minister Silvio Berlusconi seemed to make it more pariah than stalwart. 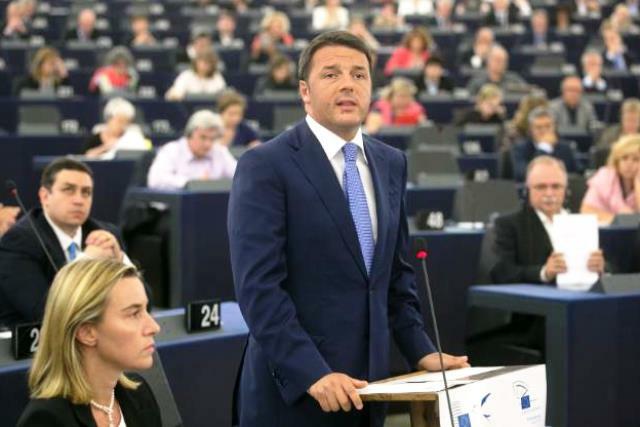 Notably, after Renzi’s landslide success in the May 25 European elections, it’s his Democratic Party — not the British Labour Party, not Germany’s Social Democrats and not France’s Socialists — that is not the largest center-left party in the European parliament. 6. British prime minister David Cameron has had a quiet victory after a very loud defeat in June. By loudly backing Tusk earlier this week, Cameron will have erased some of the damage he incurred in June, when his gambit to block Juncker as Commission president failed so miserably — by a vote of 26 to 2, Cameron’s only ally was Hungary, increasingly the EU’s problem child. 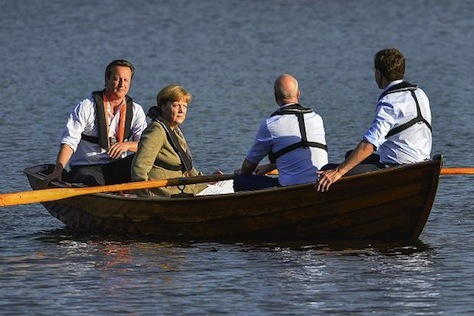 That brings Cameron (pictured above with Merkel and other EU leaders earlier this summer) generally back onside with the core of center-right figures who drive European policy, including Merkel, Tusk, and the liberal Dutch prime minister Mark Rutte. For the record, Cameron will still win credit at home among eurosceptics for having taken a firm stand against Juncker, who is viewed as the quintessential European bureaucrat. None of the maneuvering of this summer’s EU personnel decisions will necessarily make a difference to British voters in 2017, when Cameron has promised a direct referendum on British EU membership. Before that, Cameron faces the Scottish independence referendum on September 18, a general election campaign in May 2015 and an attempt to negotiate British prerogatives on immigration and justice policy from the rest of the European Union. But Cameron hopes Tusk will be an ally in his quest for EU reform, and you can be sure that he will be working to strengthen Tusk’s role vis-à-vis Juncker to the extent there’s an institutional fight over the respective roles of the Commission and Council president. 7. 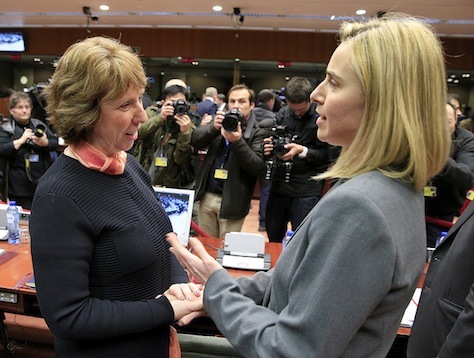 Juncker and the Council must still negotiate the rest of the Commission. What about the rest of the European Commission? Juncker and Mogherini are obviously set, but there are 26 other European nominees all vying for top portfolios within the Commission, and that’s the next step for Council leaders to decide. At least seven current European commissioners, including Germany’s Günther Oettinger and Bulgaria’s Kristalina Georgieva (the latter a dark-horse candidate for the foreign policy role) are returning from the outgoing commission headed by José Manuel Barroso. Moreover, the next Commission will feature at least four former European prime ministers, including Juncker himself, as well as Latvia’s Valdis Dombrovskis, Estonia’s Andrus Ansip and Finland’s Jykri Katainen, all of whom were mentioned as potential Council presidents during the summer. Alenka Bratušek, who recently lost Slovenia’s national elections, may also join them. 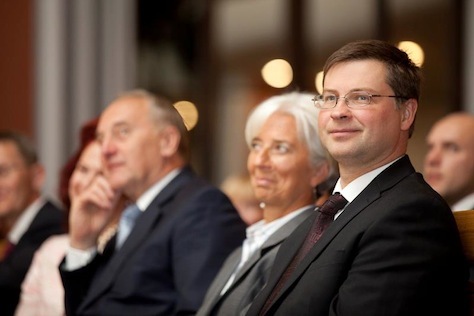 Dombrovskis (pictured above), whose fiscal prudence guided Latvia through the eurozone debt crisis, despite the pain of economic contraction and unemployment, has received credit for Latvia’s current economic progress. Though Dombrovskis resigned as prime minister last November after a freak accident, whereby a supermarket roof in Riga collapsed and killed 54 people, Latvia became the 18th member of the eurozone in January. As a reward, he is likely to receive the powerful economic and monetary affairs portfolio, to the chagrin of France, which hoped that its nominee, former Hollande finance minister Pierre Moscovici, would get the portfolio. Berlin has flatly vetoed that idea. To add injury to insult, Spanish finance minister Jose de Guindos is likely to replace Dutch finance minister Jeroen Dijsselbloem next year as the head of the Eurogroup, the group of 18 eurozone finance ministers. * Correction: The original version of this post stated that Kopacz would be Poland’s first female prime minister when she would actually be its second. The first was Hanna Suchocka, who served between July 1992 and October 1993 under president Lech Wałęsa. 1) The first Polish female PM was Hanna Suchocka (1992/3). 2) Piechociński, albeit he is a the Deputy PM, is very unlikely to replace Tusk, for a simple reason: he is the leader of the minor coalition party. Rostkowski – as it seems – has (and never has had) real political support. 3) It was not the phones that got tapped: the waiters recorded dining table talks of some officials and private entrepreneurs in a fancy restaurant in Warsaw ;-). I would like to point out that the first woman as the Polish prime minister was Hanna Suchocka in 1992-1993. Could you verify an article, where you mentioned that Ewa Kopacz would be first Poland’s female pirmie minister?